There aren’t many things in your life that grow with you for such a long period of time. Over the course of 13 years and 162+ issues, it’s now a couple years short of half my entire life opening the mailbox each month and discovering the latest in Xbox news and reviews. When you look back to the first issue in November of 2001, it was like an entirely different world. There were no cell phones, no Twitter, no Facebook. Information was primarily shared through printed copy. Although various websites would post stories and news sooner than when an issue arrived, there is still something special about receiving a magazine in the mail and getting an inside look at the industry. It’s almost the same feeling as going to a store and renting a movie. It held a special meaning, and you knew the night’s plans would revolve around enjoying that content. Now with the abundance of streaming services available, you sit on a couch and scroll through a catalogue of thousands of titles and it seems like an endeavour to choose one. I’ll admit that I’m guilty of using Twitter as my primary news source. Being in the industry I don’t have the luxury of waiting until a print copy arrives to be informed on events in the media. I’ve still continued to renew my OXM subscription each year without hesitation as it brought a certain authenticity to the content. Where anything can be published online and edited at any time, a magazine feels complete. I read them to take a step back and get away from the fast-paced online world. I am confident in saying that this magazine has a part in where I am today. I’ve kept each one, which has now grown to the 162 issue (as of June 2014) library of history, epic moments, and great games. Over the years I’ve moved a few times, and some issues ended up getting lost in the shuffle. I’ve now replaced all of them through eBay, and it’s complete again. The covers displayed in the banner above and in the other additions within this article were scanned and saved into a massive, high quality PDF. Each one was cropped, edited, and put together without watermarks for everyone to enjoy. One of the best parts to this collection is being able to see the incredible transitions in technology over the last 13 years. The way games have evolved from simple mechanics to second screens, deep worlds, and full online experiences is astounding. The people who shared these stories in the magazine displayed a level of dedication and passion that I could relate to. I enjoyed the “Meet the Team” sections at the beginning, because it provided an inside look into the personalities of the writers. Similar to Twitter, this level of interaction breaks down the walls and makes this kind of work less robotic. The little snippets at the bottom of each page also brought humour or interesting facts to the stories being shared. 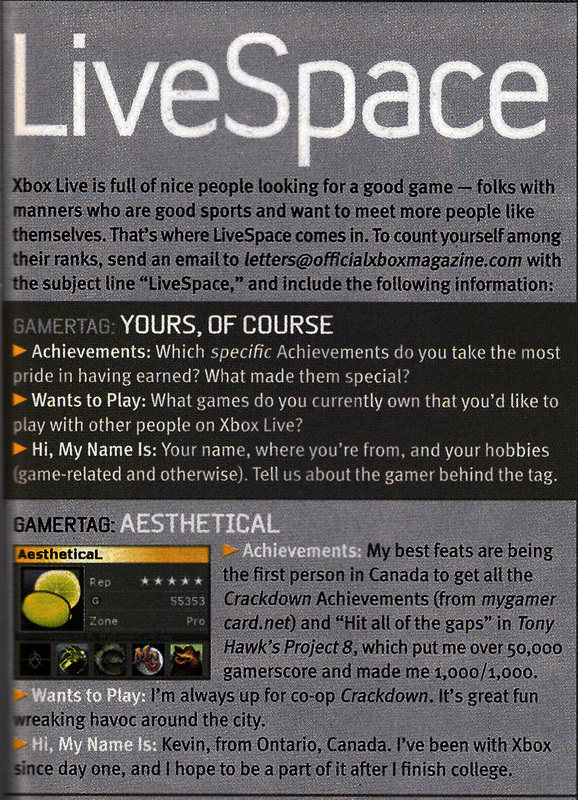 I was also featured in the ‘Live Space’ column in the September 2007 issue. It was exciting to see my name and profile in the magazine. After reading it over again, the last part stuck out to me. It’s been 7 years since this issue was published, and even then I had motivation to be a part of the industry. This has always been the right path for me, it’s just unfortunate that it took this long for me to get things in order. The magazine brought many great things for the people involved as well. Some have moved on to bigger things, allowing them to be fully engaged in their passion. It’s always amazing to see good people get to live what they enjoy doing each day. The demo disc was a big part of the magazine until January of 2012 when it was discontinued. Even though it unlocked rewards and extra content, having a physical disc for demos wasn’t necessary anymore as digital distribution became the forefront of content consumption. 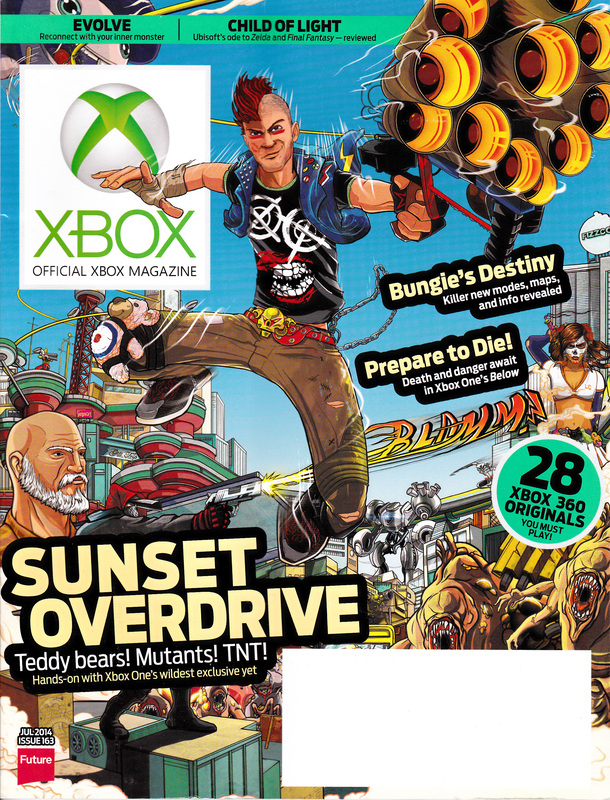 With each new change, OXM evolved into the premier magazine that it is today. This is a collection that will stay with me for a lifetime. Showcasing the best in technology, video games, and society, it acts as a great reference to each point in time throughout the last 13 years. It’s only this past generation where games went from a niche category into the mainstream lifestyle where it is today. A full cultural shift has occurred from premium, retail disc games into free, casual experiences filled with ads and micro-transactions. Many new trends will be born, and fade away in this new generation, and I’m looking forward to seeing what happens next. My best wishes go out to all of the US staff. For people like me who have been with you since the beginning, I wanted to say thank you for all you’ve done. This article has been inspired from a letter by Ryan McCaffrey at IGN. For the full PDF file with all 163 issues (plus 6 bonus issues), click here (right click, save as – size is 704MB). Updated with July 2014’s cover. If you’ve already downloaded the bundle, you can get July 2014’s cover here.